Well even if actual BDS battles (or even minor skirmishes) have not been in the news recently, there does seem to be a fair amount of talk on the subject of late. This was followed by a furious riposte by that unflagging Generalissimo (and token Palestinian leader of the largely Euro/American-led BDS movement) Omar Barghouti. Given that most Divest This readers will have already seen both pieces, as well as commentary on the exchange, I will limit my own thoughts to noting how interesting it is to watch this most European of political dust-ups (continental academics, political leaders and writers are forever engaging in belly-wumping contests of this sort, complete with flowery versions of pre-match trash-talk that accompanies professional wrestling matches), this time taking place before a largely American audience. Which reminds me… Given that Mr. Barghouti failed to mention a single example to illustrate the “spectacular rate of growth” for BDS he boasts about in his Huffpo piece, let me provide you this link to a recent boycott success. Yes, even while the Israel haters of France are marching in the streets insisting that everything must be done to help the starving citizens of Gaza, the BDS movement has finally found a group of people it can try to impoverish: Gaza farmers. On the one hand, this kind of makes sense in a world where both anti-government and pro-government forces in Egypt are accusing their opponents of secretly being in the pay of the Jews (whoops! I mean the Zionists). But it also brings up the question of why the Gaza strip, in which people are allegedly dying of starvation on an hourly basis, has figured out a way to become an exporter of food. The world is indeed a remarkable place. And speaking of BDS triumphs, what’s new in the East Coast “Belly of the Beast” of Hampshire College where student activists have had to contend with making films about their pretend divestment successes, having failed to achieve any real ones? Well they seem to have found a West Coast import to add to their repertoire: shouting down those with whom they disagree. Citizen Wald, who posted this piece, is on the story, but suffice to say that BDS’s current record of zero wins for Avogadro’s Number tries has not prevented the boycotters from getting themselves noticed, even they can only do so by acting like assholes. And while we’re on the subject of beast-bellies and the Left Coast; tomorrow I shall be visiting Ground Zero for BDS in the West, if not the nation: Olympia Washington! 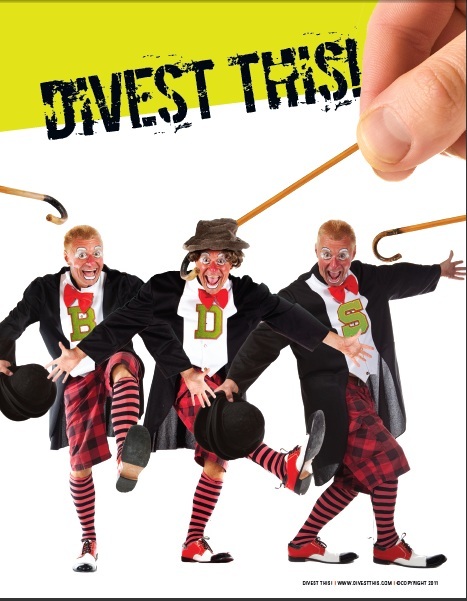 Expect news from the region (as well an update on the upcoming print edition of the Divest This Guide) next week. And finally… I’m still stuck in the Number #2 position over at the Pro-Israel blog off (albeit behind a friend and able competitor). Just two days left to vote (preferably for me)! And speaking of BDS failures, the proposed California Divestment initiative has failed, failed failed to garner enough signatures to even appear on the ballot. No press releases from Team BDS. No Twitter. No flash mobs. Just silence.